Whatcha lookin’ for, Raylan? Some whiskey, maybe? 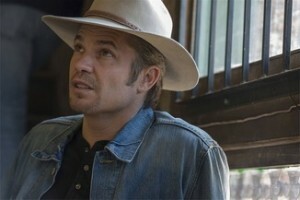 This week’s episode of “Justified” was titled “Raw Deal,” and that’s about what it was for bourbon fans. There was a blink-and-you’ll-miss-it shot of Maker’s Mark being poured at a bar (I had to go back and pause the DVR to be sure), and a pretty sweet offer of Blanton’s to Allison from Raylan, which she did not take him up on. That’s it.